It feels like years in the planning, which in some ways it is, but the 2013 Open Heart International Rwanda trip is now only six weeks away. This past Sunday was our first packing day. An opportunity for some of the team, or at least the Sydney based members of this international group, to come together and help pack all the supplies needed. For those of us new to Open Heart International, of which there are a few, it was the first time we really “got our hands dirty” and met our fellow volunteers. For some, namely me, it was my first entry into the world of medical supplies and the true nature of the work undertaken. Despite jokes that I would be operating syringes in no time it was an overwhelming moment (there will be no syringes in these hands I can assure you.) By way of introduction, I’ll be your online guide for the Rwanda trip. Partnering with Richard, our filmmaker, our job will be to share the stories of the people whose lives are touched by OHI: the patients, the families, the volunteers, the local medical teams. Our journey starts locally. 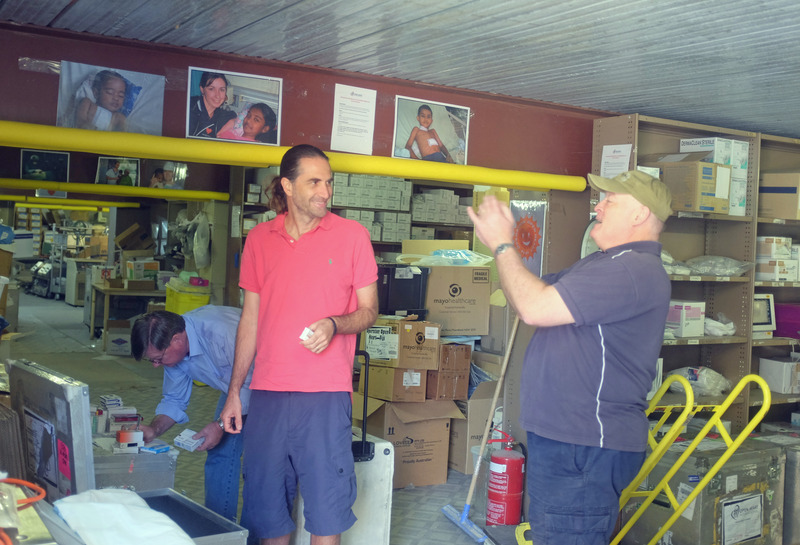 The OHI “base camp” in Wahroonga is a cavernous space, filled with an array of medical supplies and equipment that support the 13 countries the team visits. The logistics of running such a program, the cataloguing, packing, shipping, documenting cannot be underestimated and it is a testament to the people involved that it all runs so smoothly. In the next week the packing will be finalised and the pallets of materials shipped off to Kigali. Here in Sydney we continue to fundraise for the trip and begin the individual process of preparing for the next part of our journey.